So, guess what? I actually like winter. One of the reasons I love where I live is because I love seasons. Some more than others, and winter is probably my least favorite. BUT, I still like it. While I do wish that come March 1st, I could flip a switch and make it spring, over the years I've come to appreciate winter for a few different reasons. One, it makes me appreciate summer so much more. Believe it or not, I wasn't always the biggest fan of summer (uggghhhhh it's so hoooottttt. I'm tired of wearing sun screen! The sun is hurting my eyes!). In my defense, I have really sensitive eyes, but generally speaking, I was weird. After a few winters in Chicago, summer was my new favorite thing of life (I looooove sweating and taking three showers a day! Bathe me in SPF 500! I'll wear two pairs of sunglasses! I LOOOOVE SUN! And popsicles!). So now, being a lover of all things warm weather and everything that comes with it, winter has made me appreciate it all that much more. Second, I kind of love the smell of snow and cold air. Love it so much. You can easily catch me outside just sniffing the air when it snows, or is about to snow. Also, seeing a blanket of snow outside is so calming and beautiful. Lastly, I love to hibernate. While I'm a homebody all year long for the most part, winter is the ultimate season for staying in, eating pasta, drinking a good pinot and having movie marathons. It's like, all you can really do in the winter (well, you can ski and stuff but you know). Monday: Hey, it's cold out, let's make a hearty pasta and drink wine to warm up! Tuesday: Hey, it's still cold out, let's make pasta and drink wine! Wednesday:It's still cold! Pasta time! You get the point. I look forward to this time every year because it forces me to relax, catch up on reading, finish up all my half-started organization projects and well ... do nothing. It's like a homebody's dream come true! 1. We need to finish our master closet. Currently, my clothes are split between two rooms (that we don't sleep in) and Josh's clothes are shoved into a tiny little closet in the room we're sleeping in. At first, it wasn't bad, but now I'm over it (seriously, what closet is that stupid shirt in!?). Josh is officially done drywall-jointing the closet walls, so it's time to paint! We also need to map out our shelving system and decide how we want to design the closet. Then, you know ... install it all, put down the new hardwoods and install the new ceiling light that we bought like a month ago. Our goal is to get the entire closet done by the end of January/early February. 2. Paint our upstairs hallway and our bedroom hallway. 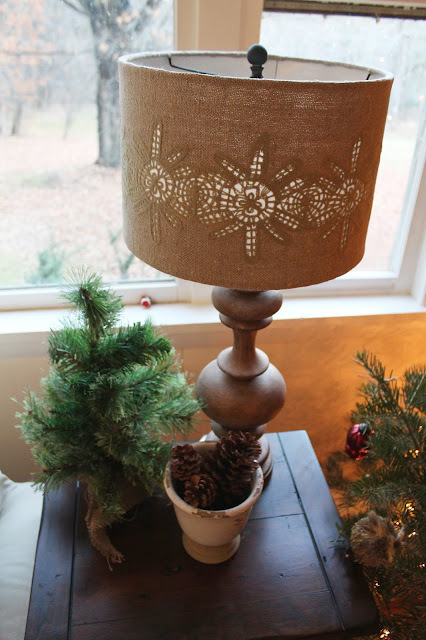 When we moved in, our upstairs and bedroom hallways were covered in wallpaper. Thankfully, removing it was very easy, but I never got around to painting. I can't wait to paint the upstairs hallway just so we can hang up some photos and wall art to make it look more homey. And painting our bedroom hallways will just make things prettier to look at as we walk by since it's not closed off by a door (yet). 3. Get our master bedroom move-in ready. While I don't think we'll be able to tackle the actual bedroom ceiling for a while, we really, really want to finish the walls and floors by spring. Our closet was a test run to see if these were, in fact, projects we could handle on our own (we could - yay!). But that was such a small space, and our bedroom is so much bigger, so it'll be a pretty intense project. We need to repeat everything we did in the closet (remove the paneling on the walls, joint the drywall, paint and install the flooring). BUT, if we can just do that, and get our furniture moved in, that will fell sooooooo good. And it'll be amazing to have everything in one room as opposed to having furniture and clothes in every other bedroom of the house. 4. Finalize a layout for our bathroom installation. We plan to take part of our guest room and turn it into a bathroom upstairs so our master bath is more private, and so guests to have their own space when they visit. We've gone back and forth on the layout for so long, and every time we to try to finalize a plan, we just somehow get away from it because it's actually a very daunting task. After stepping away from it for a bit, we both feel more refreshed and ready to figure this sucker out. By spring, we want to have a contractor scheduled to begin installing the plumbing and electrical for the space. Then, believe it or not, Josh wants to tackle everything else himself. Good times! That project will go well into summer, for sure. It's quite the list. But I'm so glad that we took a bit of a break because we needed it to prepare ourselves for all of this. And if I mix it in with a night or two of "wine and popcorn for dinner" while watching three or four movies in a row, I can totally handle it. Our plan to relax during the holidays was probably the best decision we've ever made. Except for the fact that I'm doing a lot of relaxing and Josh is still working really hard around the house in his free time. But, today he finished prepping our closet for painting, so it's possible we could have that done before the New Year. 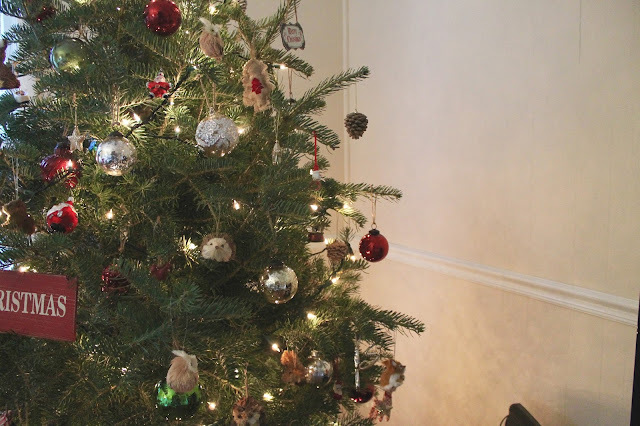 In the meantime, I've just been walking around the house in my PJs in my free time trying to add more sprinkles of Christmas in places that didn't seem ... well ... Christmasy yet. Like our kitchen. We spend a lot of time in there and it needed some holiday touches. 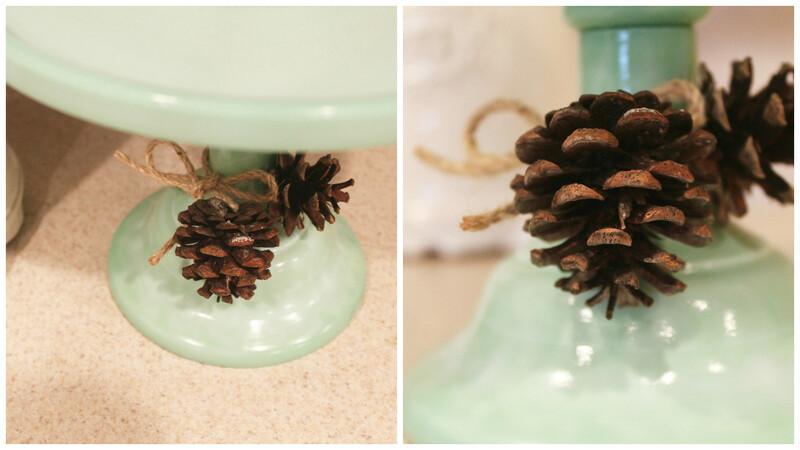 So I just decided to wrap some twine and pinecones around our mint green cake stand and put a burlap tree on it. Done. The wall we started and never finished over the summer has looked sad ever since, and because of that, I wasn't going to do anything to it at all for Christmas, but I decided to throw another burlap tree on it, and make that our Christmas card display area this year. Since doing that, it's already brightened my mood. And thank you to everyone that has sent us a card this year so far! Especially Jess' photo card of little Miss Ruby Tuesday. Hopefully by this time next year, the open shelving that's supposed to go here will be done, and the beadboard trim will be installed. This morning I slept in (which feels amazing when you wake up at 4 a.m. every day) and then I started to bake cookies. Baking cookies during Christmas, for me, is relaxing and it totally makes me happy. I bought a cookie press this year, too, because I'm always coveting the perfectly shaped little butter cookies I see in Italian bakeshops. And this very not Italian girl had way too much fun with it. 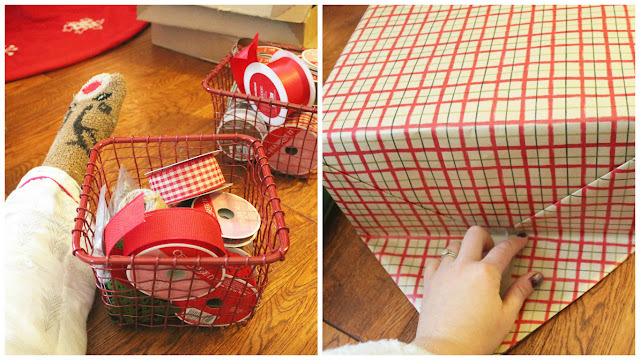 I also set aside time to wrap Josh's presents today, too (while watching a horrible Lifetime Christmas movie, of course). I also filled Josh's stocking, which sometimes, I think I enjoy more than presents. 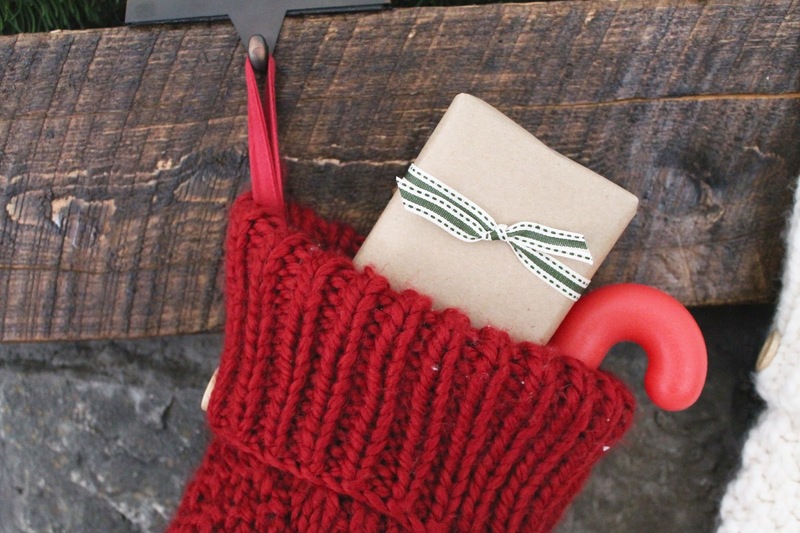 We could just do stockings every year and I'd be way too excited about it. And finally, we put up some outside lights. We've had these snowflake lights for a few years, and we knew we wanted to put them up on our front porch here so we could see them twinkle from our kitchen window. 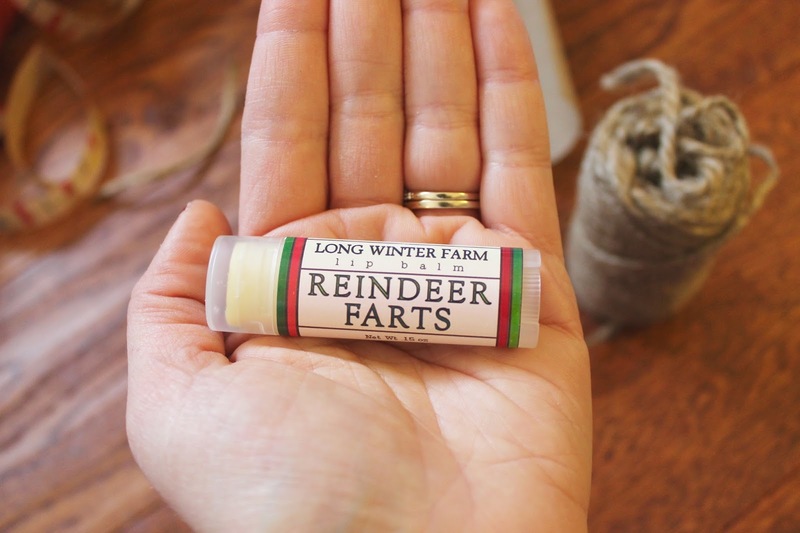 On a side note, my new favorite thing is this Reindeer Farts lip balm from Long Winter Farm Soap Co. I tried it for the first time yesterday and it straight up smells like Christmas. I can haz all the reindeer farts? 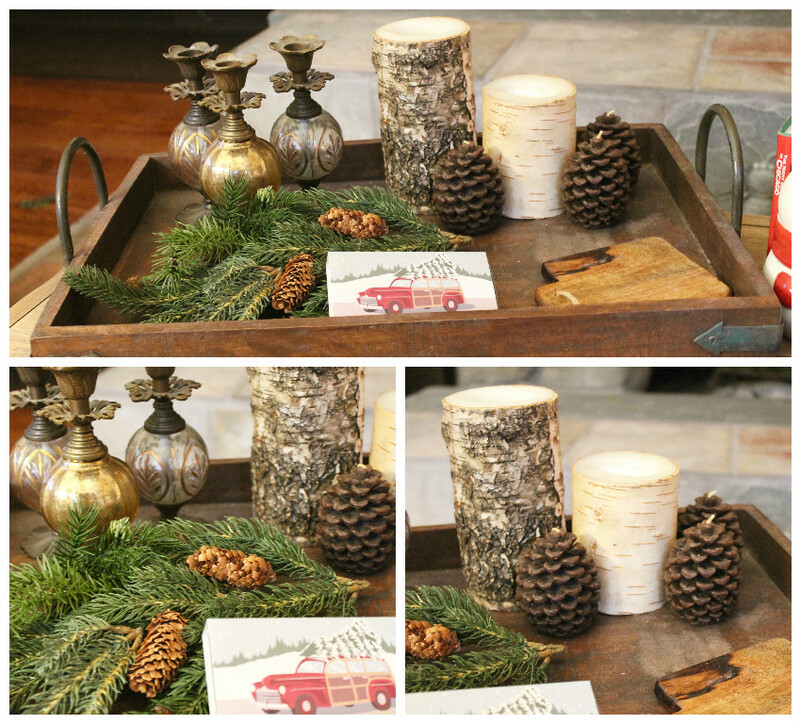 Holiday Home Tour: Is It Woodsy Enough In Here? Operation Home For The Holidays is complete! Well, kinda. Josh is still trying to get our closet upstairs done so I can paint it, and maybe ... maybe ... we'll be able to install the actual closet units before Christmas. BUT, for the most part, it's time for us to just enjoy the house, and the holiday season by spending time watching really made made-for-TV movies and stuffing our faces with advent calendar treats while wearing stretchy pants. 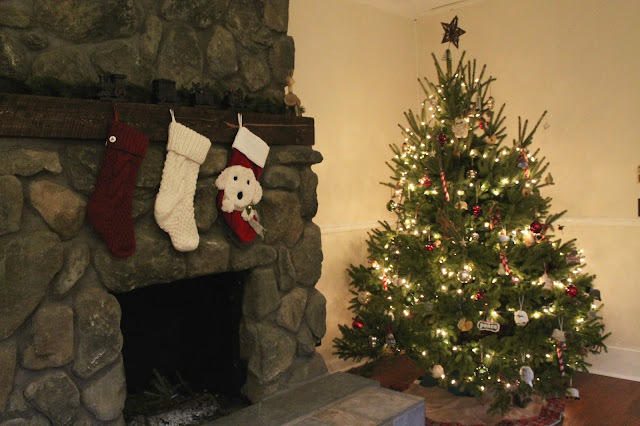 This weekend, we started to decorate for Christmas. 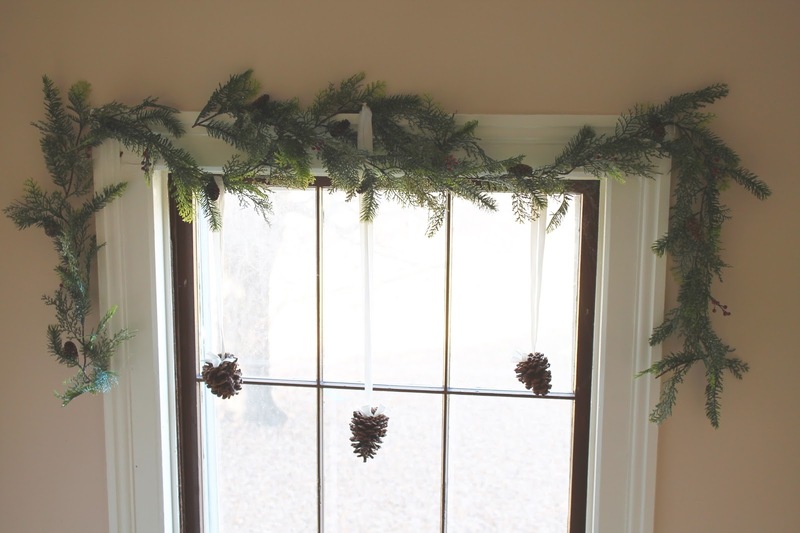 Going into the season, I was setting goals of making this house perfect, with every room decorated for Christmas, glowing with twinkly lights and draped in garland. But, then I realized how overwhelming that was, coming from a small apartment. 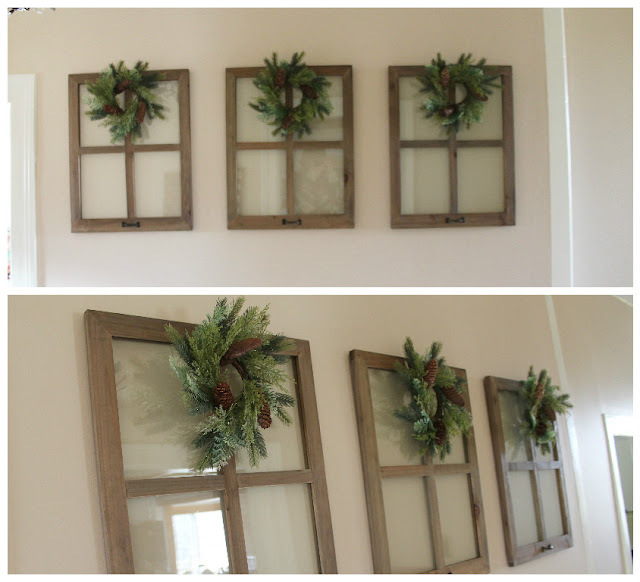 We already had a lot on our list to buy to fill up our two living spaces and entryway, so we decided to focus on these spaces for this season. Every Christmas after this one, we'll pick a new room to buy decorations for, and just keep adding until we're done (so, like, never). 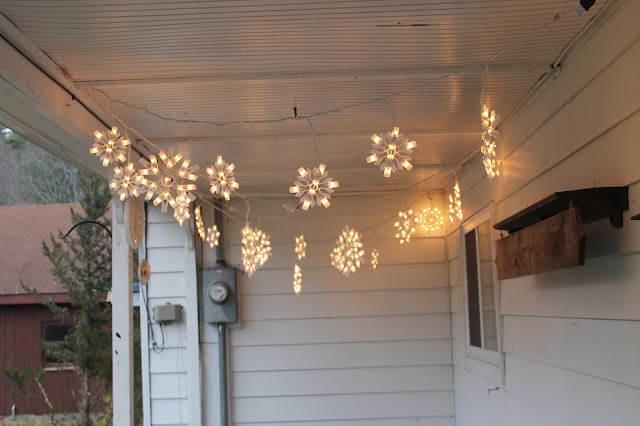 Over the years, I've gone in all different directions with Christmas decorations. I think the first year Josh and I lived together, we went traditional green and red. Then for a few years, we went off into urban/colorful mode. Then we landed somewhere in between. And now, we're back to traditional with a little bit of rustic cabin, and that's also where we're staying. It's taken us 10 years, but we've finally figured out our style, and what makes us feel like home. For Christmas, I like to decorate for the winter season as much as I can because I hate to put everything away come January. 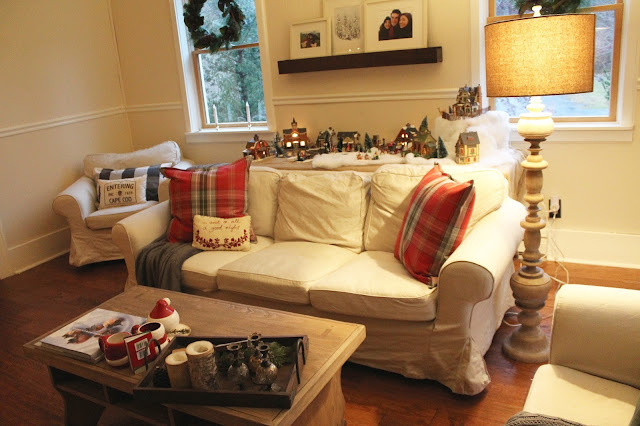 I try to buy staples like pillows and throws that I can keep out all winter long so that when the Christmas decorations do go away, the house still feels wintery and cozy. Lately, I've been inspired by cabins and lodges for wintery decor and I tried to bring some of that into our holiday home, too. Let's start with trees. 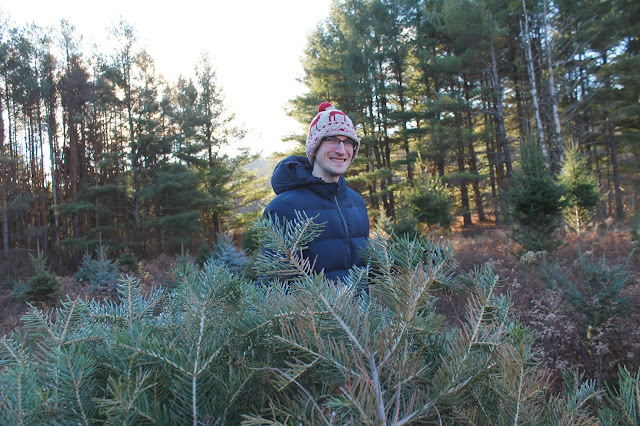 So, we have a tree farm, and all we had to do was walk down, cut down a couple of trees and lug it back to the house. Yay! 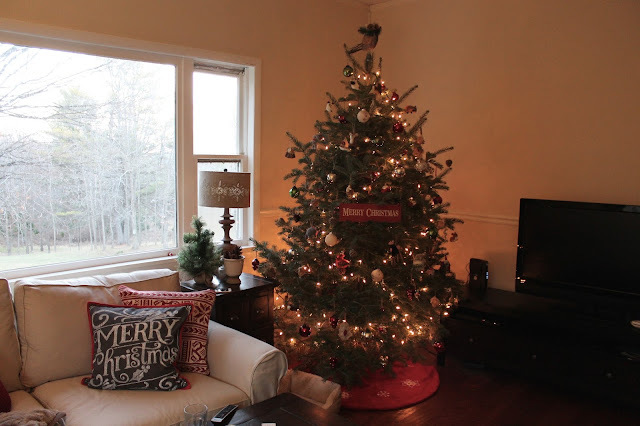 We decided on two trees this year: one in each of our living rooms. Once our bedroom is done (hopefully by next year!) 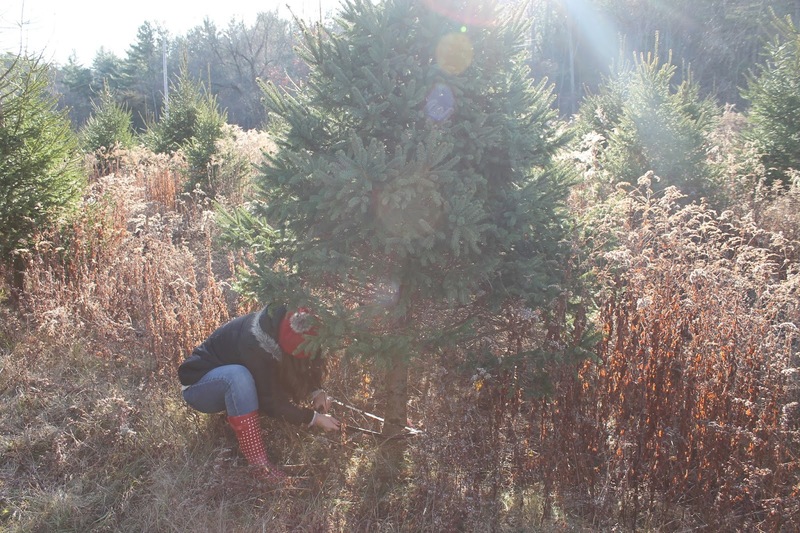 we plan to put a small tree in there since we, you know, have like a thousand of them. Our first tree from our farm! ... moving on to entryway, we decided to keep it simple this year, and just added a few touches. 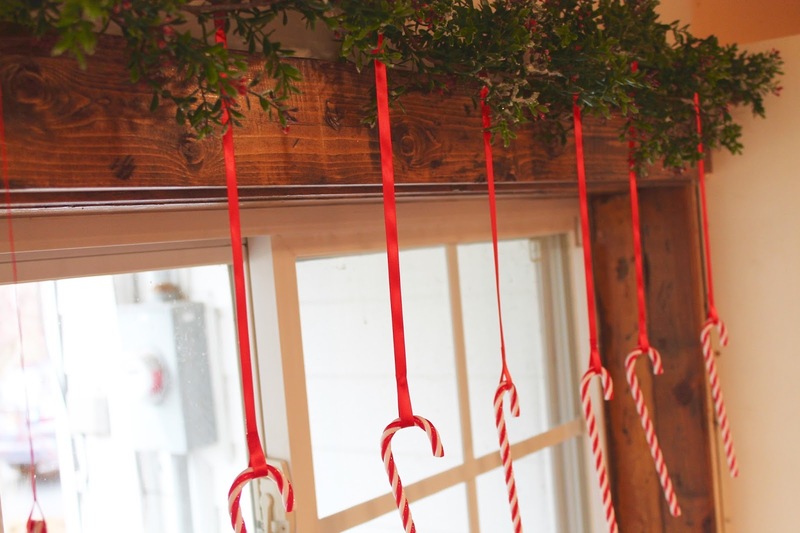 Someday, I really want to wrap garland all along the stairway railings, but as it was, we felt like we were leaving craft stores every weekend with carts full of garlands and wreaths so we held off on that this year. 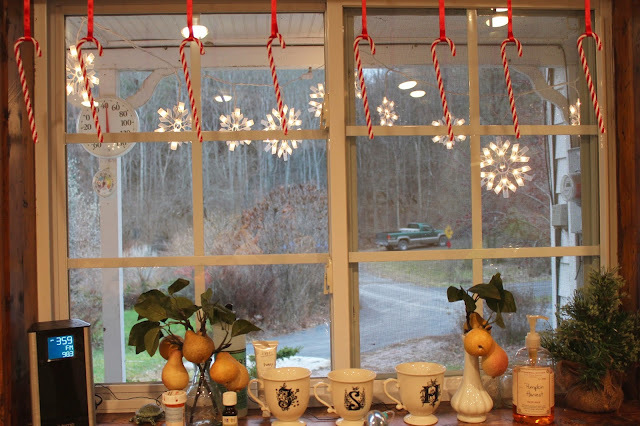 We just added a few small wreaths to our little windowpane wall decorations and dressed up our landing window a bit. We also did one small little decoration in the kitchen on our window. I've had a pin on Pinterest saved for, oh ... only a year or so, and I just really wanted to make it happen this year. 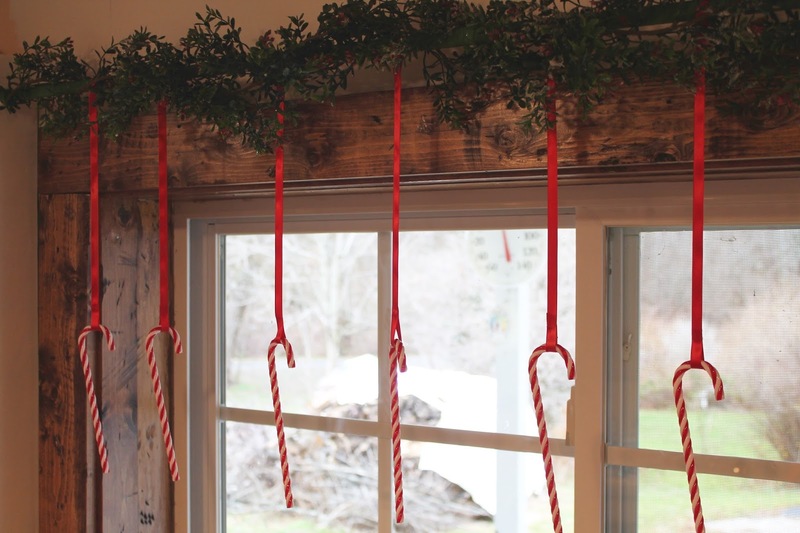 Next year, I need to add some extra garland so that it hangs down both sides and hides the tension rod a bit more (which I wrapped in green floral tape to conceal it a little), BUT, overall, I still kind of love it. One side of our window trim isn't done ...no big deal. 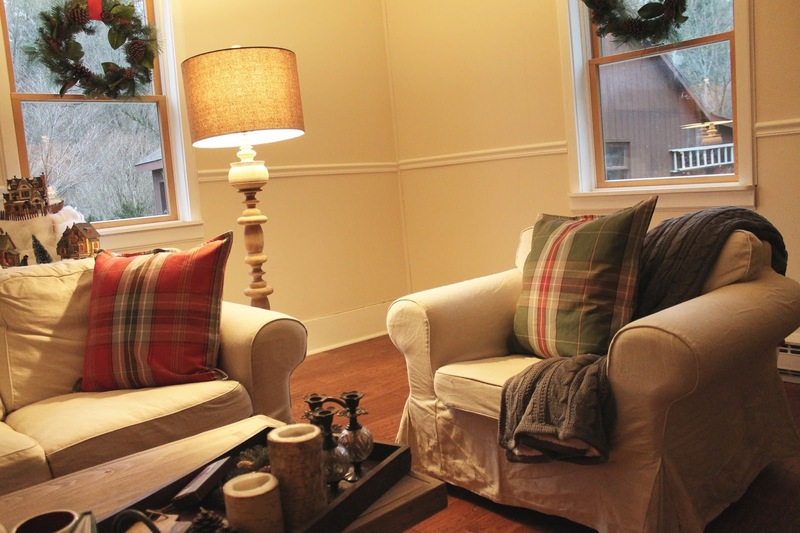 Our front living room is where we decided to concentrate on, since we foresee this space being our relaxation room during the holidays, where we can start a fire, address our holiday cards, wrap gifts, and spend quality time together without the distraction of the TV. We put our bigger tree in here, along with our stockings, and also hung wreaths in the windows. 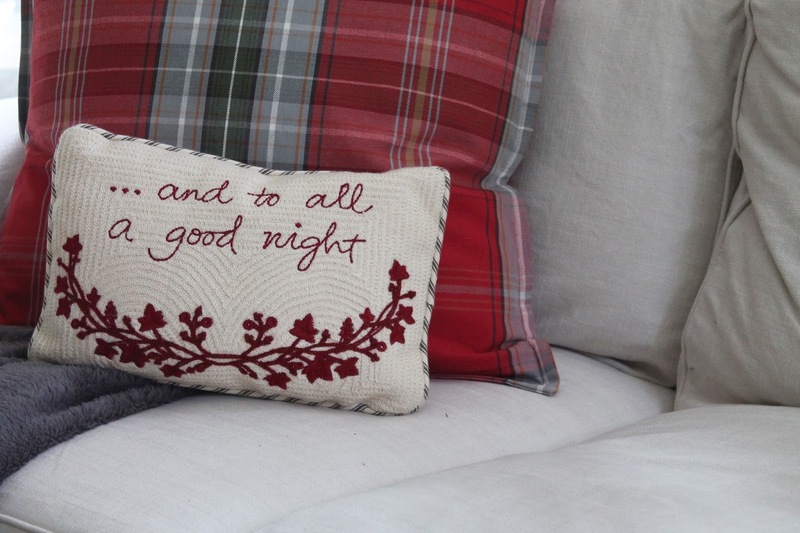 For pillows, since we didn't have any for this room, I bought all new ones at Pottery Barn*. 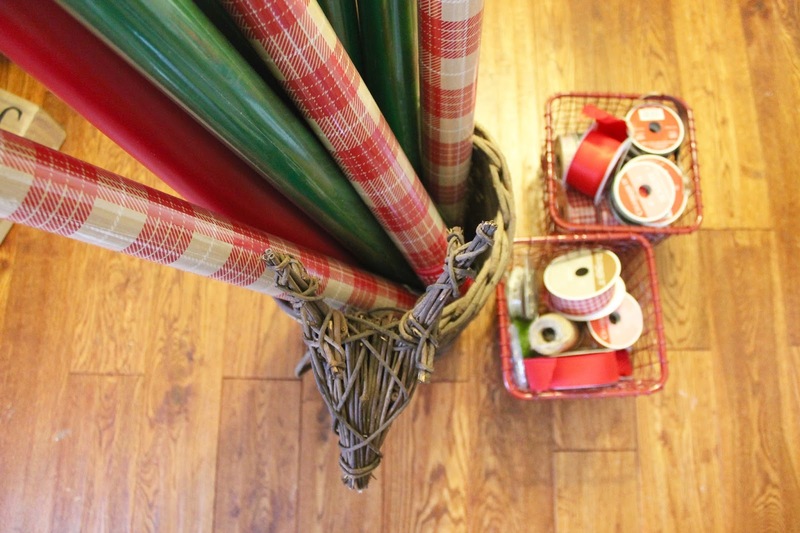 I love the red and green plaid, and the gray and white buffalo check mixed together in the same room. To tie them together, I added gray throws on the chair and sofa. 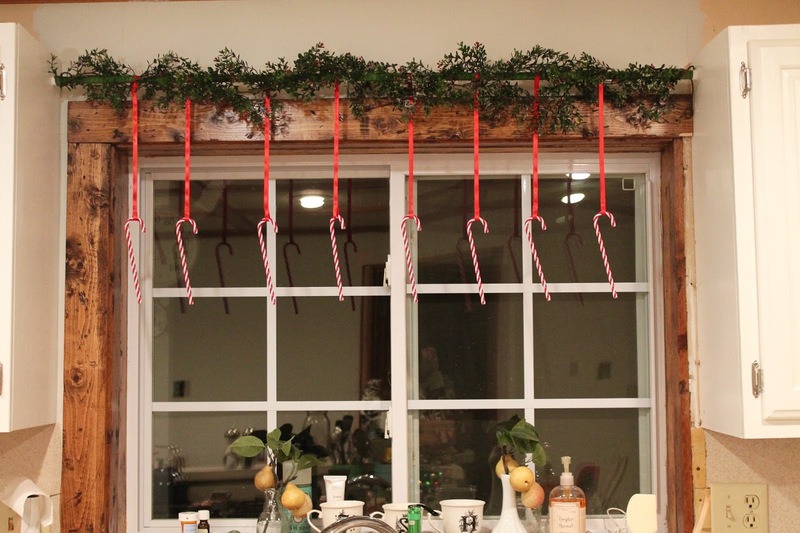 and it's so fun dressing up our bar area every season. 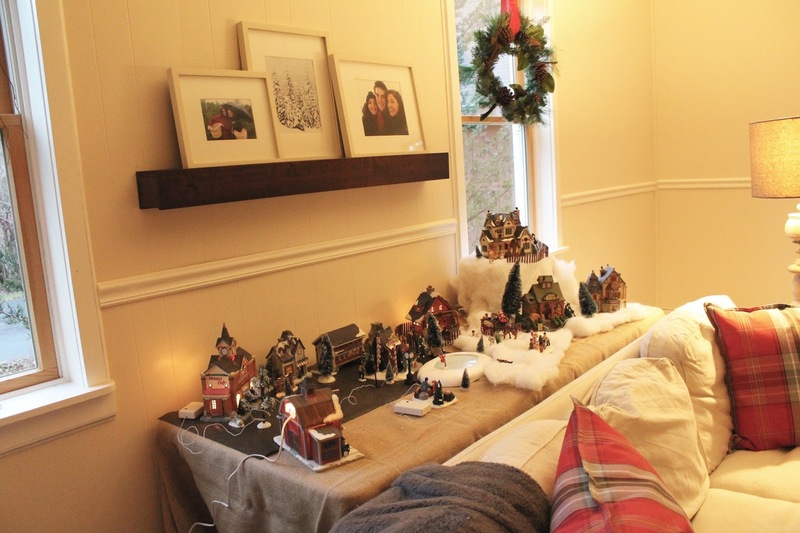 While I'm kind of in charge of most of the Christmas decorations, Josh is all over our little winter village. We bought a 6-ft banquet table with a burlap floor-length tablecloth for it this year, and now we have plenty of space to buy more pieces! I think Josh's favorite, though, is our tiny Wegman's grocery store. Betty's stocking is the biggest, even though she's a 7-pound dog. But the likeness of her on the stocking was too perfect to pass up. 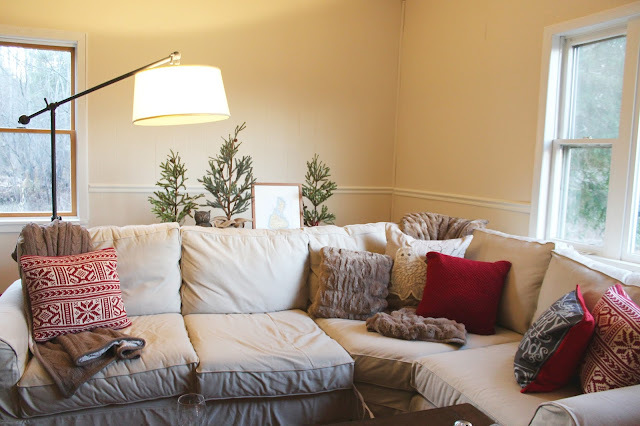 For our other living room, I tried to keep it more woodsy-inspired, and I'm not really sure if I did that, but I'm goin' with it. I still keep asking myself, "Is this woodsy enough? More pine trees!? Okay. Josh! We need to go back to Michaels!" 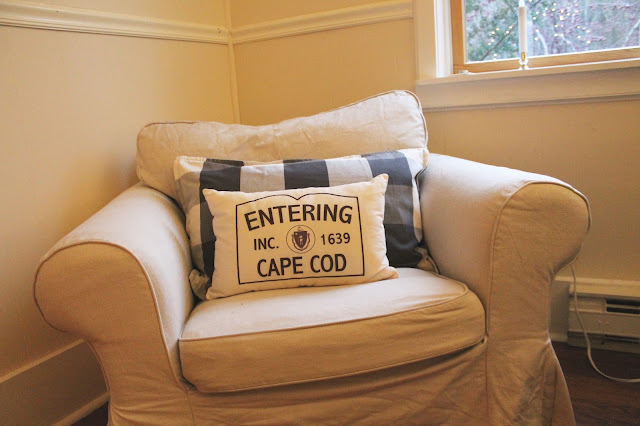 The pillows I used we've had for a couple of years, and the only new one is also from Pottery Barn* from this season. 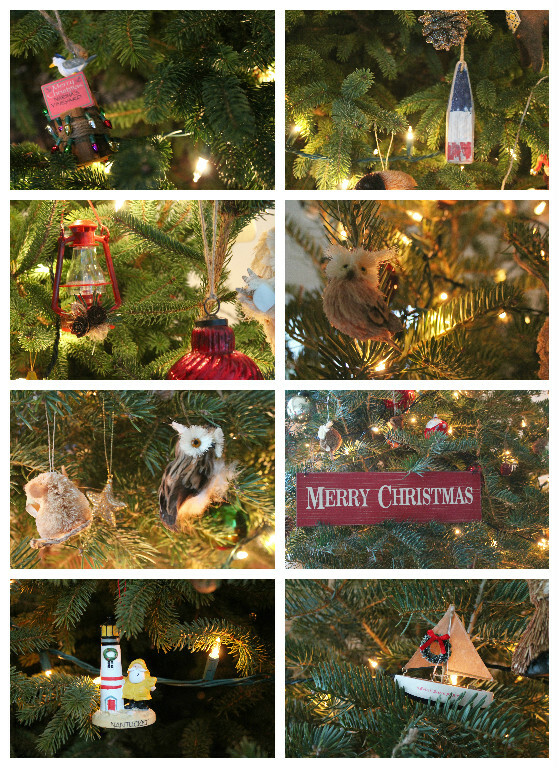 One of my favorite parts of decorating for Christmas is our ornaments. I'm kind of obsessed with all of them. 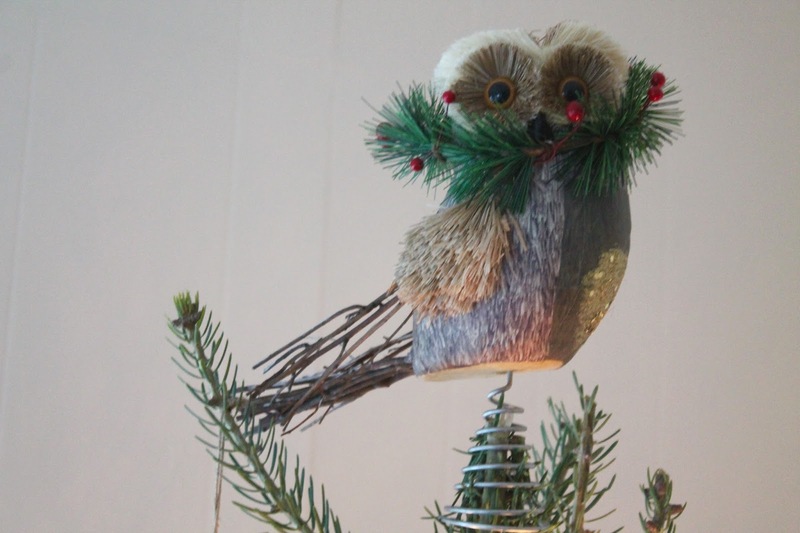 I love all our little woodland creatures mixed with traditional mercury and all the ornaments we've accumulated during our travels. but I can live with it for 8-ish bucks. The back of our sofa area is still a little fuzzy for me. 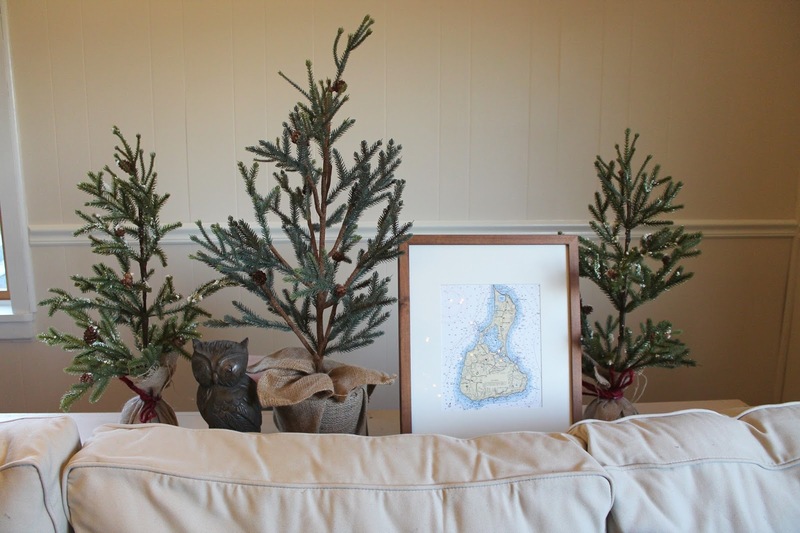 I kind of just threw some faux pine trees, an owl decoration and a framed map of Block Island back there for now. We still haven't unpacked all our boxes, and I know I eventually want to do a frame wall collage on that back wall, but just for now, this is kind of what I have. I don't love it. I don't hate it. And that's all we have this year for Christmas. 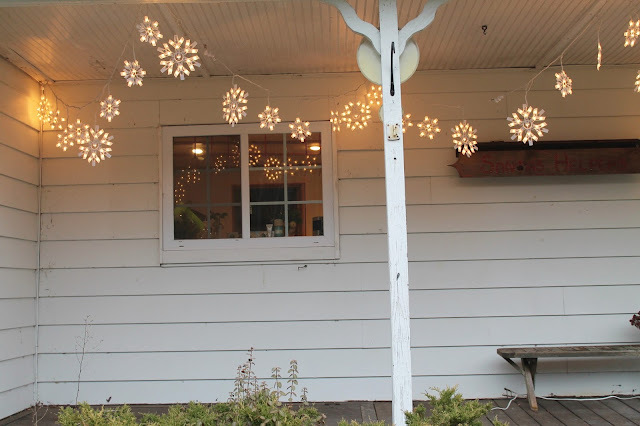 Next year, I think my focus will be our dining room, since I'm hoping we'll have that painted, new trim put up and a new light fixture installed. Fingers crossed. I mean, we have a year, right? Famous last words. 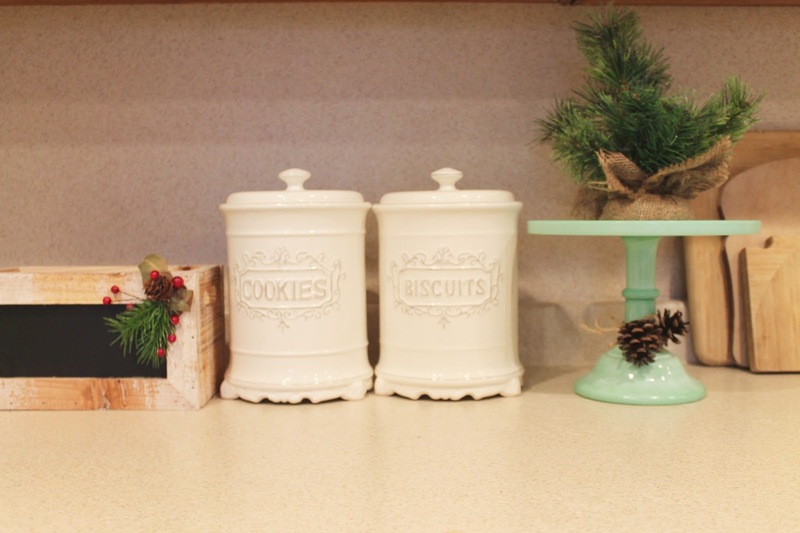 *I work for the Williams-Sonoma brand and received an employee discount on these products.